Ketosis is the state where some of the energy your body uses comes from ketones. The ketone levels only rise in your body if it readily metabolizes fats. So, essentially ketosis is a state where your body burns fat to fuel different activities. And that, of courses, results in weight loss. Overall, it comes as no surprise that ketosis is beneficial to weight loss even according to scientific research. However, getting into ketosis state and staying in it isn’t’ exactly easy. And it takes work, planning and sometimes you might need a little bit of help. 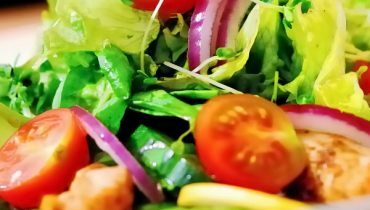 So, I thought I’d share some of the ways you can get into ketosis faster based on scientific research. This blog is supported by readers purchasing featured products. When you buy products with my links, I earn a commission at no extra cost to you. Here is my full affiliate disclosure. First of all, incorporating more fats into your diet is essential if you start eating low carb. You want to have a reliable source of energy that’s long term. Secondly, fats increase ketone levels in the blood. Proteins, on the other hand, can increase glucose levels in your blood making it impossible to reach ketosis. Therefore, fats are essential if you want to reach ketosis faster. The easiest way to get more fats into your diet is by consuming more nut butter. 2 tablespoons of this nut butter have 20g of fats and only 2g of Net Carbs. I recommend Keto Perfect nut better mostly because it’s delicious. Also, it’s made out of multiple nuts: macadamias, cashews, and coconuts with MCTs (more about these later in the article). It’s a great snack option when you’re craving for something sweet, you can also add it to your favorite smoothies to increase fat intake. 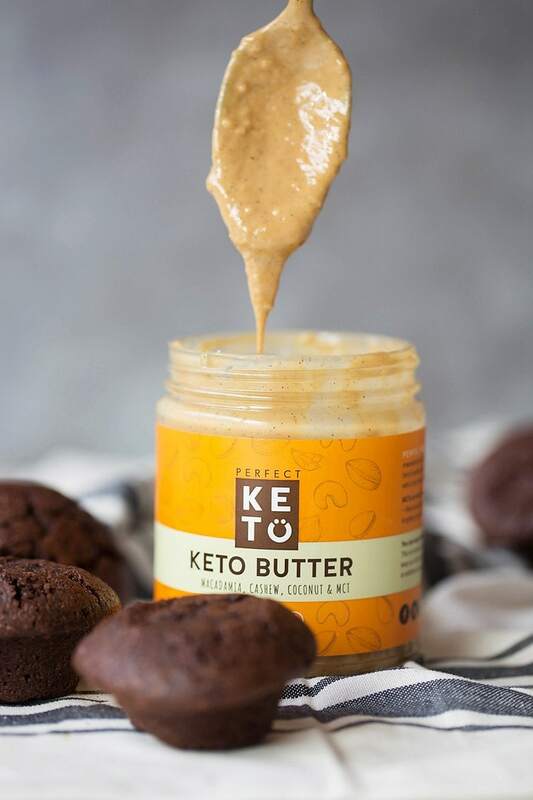 Also, it’s great for a lot of keto desserts and regular recipes. However, my favorite thing about this nut butter (or any nut butter) is that it’s plant-based. When you’re on keto, you end up consuming a lot of animal-based products. Therefore, incorporating as many plant-based, low carb products into your diet is essential. Obviously, the very key to getting yourself into ketosis is cutting on carbs. That’s because no matter what you do if you keep on consuming carbs, you’ll never get into ketosis. To put your body into ketosis state, you need to eat under 25g of Net Carbs a day. That’s assuming that you’re eating 2,000 calories a day. The general for the standard keto diet is to consume 75% fat, 20% protein, and 5% carbs. Obviously, the standard keto diet isn’t the only way to go. You can also eat a cyclical ketogenic diet with 5 low-carb days and 2 high-carb days. I generally suggest it if you want to be more flexible and eat more plant-based foods. Also, if you want to build muscle and you’re working out, another option is to consume 60% fat, 35% protein, and 5% carbs. 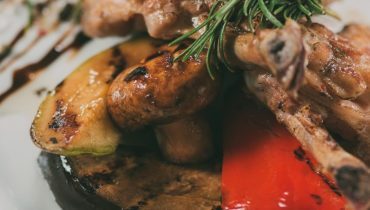 That will mean that you probably want to consume more lean meat such as chicken. If you’re struggling to find foods you can eat to stay in ketosis, I’ve shared loads of keto recipes on my blog. These include: under 5g carb meals, keto casseroles, keto chicken meals, keto lunch ideas and much more here. Boosting the ketone levels in your blood has a couple of benefits that will help you with getting into ketosis state. Now, don’t get me wrong, it’s not some magical supplement that will make you lose weight. Not at all. However, it’ll help you to increase ketone levels in blood and decrease appetite. 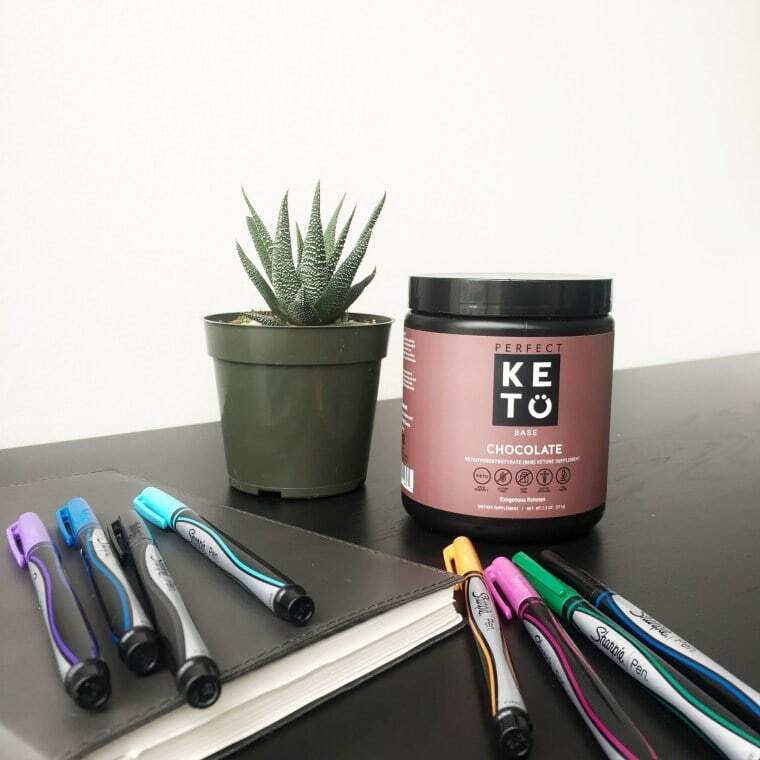 Since ketones are used by the brain as an energy source, you’ll also experience mood improvement or even mental sharpness. All of these little things can help you to stay on track with your diet much easier and eat less. All of which will lead to ketosis and weight loss. Perfect Keto Exogenous Ketone Base is the leading supplement in the market right now. That’s for a couple of reasons. First, it tastes amazing and comes in 5 flavors. Coffee one is my favorite for obvious reasons haha! Also, it’s made out of natural ingredients, and it tastes sweet but doesn’t increase blood sugar levels. If that’s something you’re interested in, you can get it here. When we’re exercising, our bodies don’t usually go and burn fat right away. That’s mostly because using fats for energy is a more difficult process that requires more energy from the body. The primary resource of energy is glycogen which is stored in the liver and muscles. When we workout, our bodies use up the resources that then get replenished with carbs. If you eat a low carb diet, your body starts burning fat to get the energy because the glycogen levels are very low. That’s great for weight loss. Plus, since your body is burning more fat, the ketone levels in the blood rise too. These are then used as an alternative energy source for muscles and brain. So, hit the gym to make sure your blood glucose levels stay low and you’re in the state of ketosis for longer. Once your body starts using fats as the primary resource of energy. The biproduct of burning fats is ketones. That’s where ketone testing strips come in handy. They measure ketone levels in the urine. These will basically tell you whether you’re in ketosis or not. That’s important so that you understand what’s going on with your body and adjust your diet or the course of action accordingly. These simply offer an easy way to track where your body is in terms of ketosis and weight loss. Medium-chain triglycerides (MCTs) are partially man-made fats. While most people are usually used to taking protein supplements, MTCs are more suitable for those on the keto diet. Digestion of MTCs results in ketones which are proved to suppress appetite and improve brain activity. So, if you’re not sure whether you’re getting enough fats in your diet, taking MCTs will help you with that. 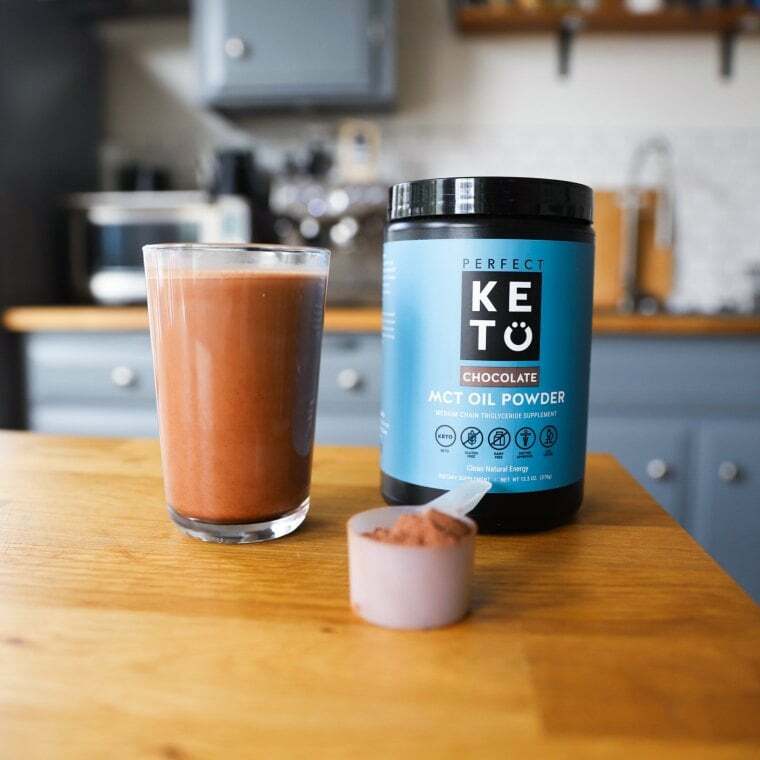 Once again, when it comes to keto supplements – Perfect Keto is one of the best brands out there. They created this MCTs supplement that’s completely clean and natural. It also comes with acacia fiber which improves digestion and gut health. Add it to your coffee, smoothies, pancakes or other favorites. If that’s something you think might help you with your keto and weight loss goals, you can get one here. Not eating for a longer period of time is obviously an effective way to lower glucose levels in your blood. Skipping breakfast can help you to get into mild ketosis before you have your lunch. Intermittent fasting is the sort of fasting you do regularly. However, it’s definitely not for everyone. Some thrive on fasting and feel a boost of energy. For others, it’s simply not a sustainable way to eat. I’ve tried intermittent fasting myself. And it did initially help me lose some weight. However, I didn’t find it sustainable. But I know tons of people who love and feel great! So, certainly, give it a try and use ketone strips to see whether it’s helping with ketosis. In addition, you could try a fat fasting. 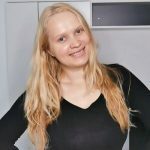 It’s the sort of fasting technique that can put you back into ketosis very quickly. The idea behind it is to eat around 1000-1200 calories a day, of which 85-90% should come from fats. 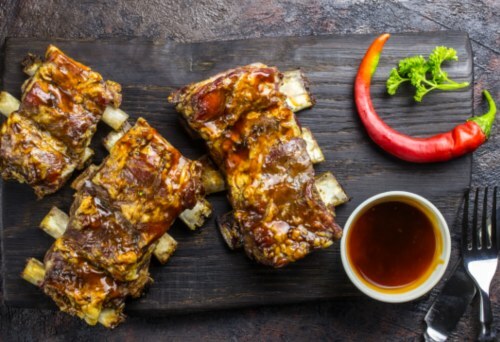 It’s an extreme version of fasting for those on the keto diet. Also, you can only follow it for maximum 3-5 days in a row. Additionally, it’s not recommended for keto beginners. So, be careful with this one. 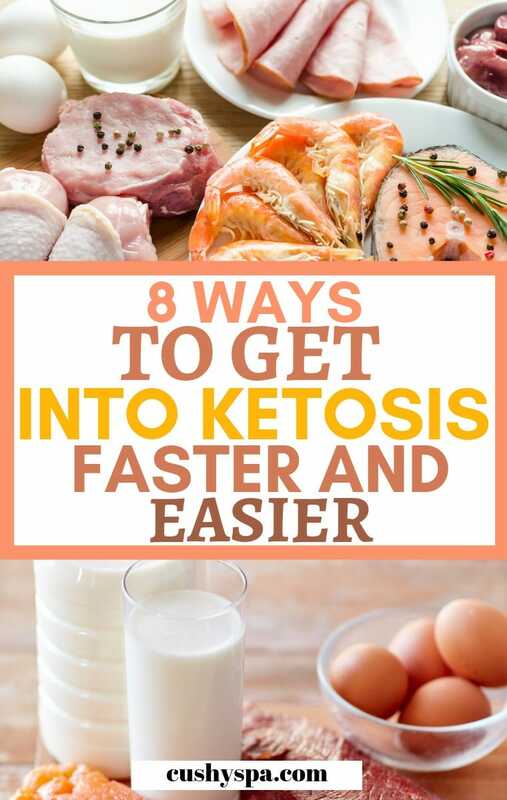 But, if you’ve been on the keto diet for a quite a while, you can always give it a try if you need to get back into ketosis very fast. First of all, proteins are very important for our health. They’re essential for building muscles, maintaining essential metabolic reactions as well as other body building blocks. So, you should always make sure that you’re consuming enough protein. Especially, if your goal is to lose weight – building muscle is essential to maintaining a healthy weight and burning fat. However, protein, in some cases, when digested, can become glucose. So, it has the ability to raise your blood glucose levels and prevent you from getting into ketosis. So, make sure you’re getting the right amount of protein without overdoing it. Let me know whether you’ve tried any of those tips. How do you get into ketosis faster? Also, if you have any questions, just comment below. The whole science behind the ketogenic diet, ketones, and ketosis might seem a little bit complicated! So, feel free to ask whatever you want! Thank you for this article! Very helpful and interesting!! Keystone is that sufficient ?